For the drug with the same street name, see methamphetamine. For other usages of the similar term, see Shabu. Shabu-shabu (しゃぶしゃぶ) is a Japanese nabemono hotpot dish of thinly sliced meat and vegetables boiled in water and served with dipping sauces. The term is onomatopoeic, derived from the sound emitted when the ingredients are stirred in the cooking pot. The food is cooked piece by piece by the diner at the table. Shabu-shabu is considered to be more savory and less sweet than sukiyaki. Shabu-Shabu was introduced in Japan in the 20th century with the opening of the restaurant "Suehiro" in Osaka, where the name was invented. Its origins are traced back to the Chinese hot pot known as instant-boiled mutton (Shuàn Yángròu). Shabu-Shabu is most similar to the original Chinese version when compared to other Japanese hot-pot dishes (nabemono) such as sukiyaki. Suehiro registered the name as a trademark in 1955. 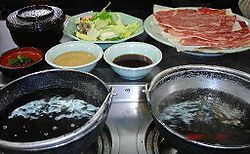 Together with sukiyaki, Shabu-Shabu is a common dish in many parts of Japan, but also in local Japanese neighborhoods (colloquially called "Little Tokyos") in countries such as the United States and Canada. The dish is usually made with thinly sliced beef, but some versions use pork, crab, chicken, lamb, duck, or lobster. Most often, ribeye steak is used, but less tender cuts, such as top sirloin, are also common. A more expensive meat, such as wagyu, may also be used. It is usually served with tofu and vegetables, including Chinese cabbage, chrysanthemum leaves, nori (edible seaweed), onions, carrots, shiitake mushrooms and enokitake mushrooms. In some places, udon, mochi or harusame noodles may also be served. Wikimedia Commons has media related to Shabu-shabu. ^ Asimov, Eric (28 October 1994). "Article 658847 -- No Title". Nytimes.com. Retrieved 30 January 2019. ^ a b c "ニュースリリース|ミツカングループ企業サイト". ^ Ishige (2014-06-17). History Of Japanese Food. Routledge. p. 233. ISBN 9781136602559.